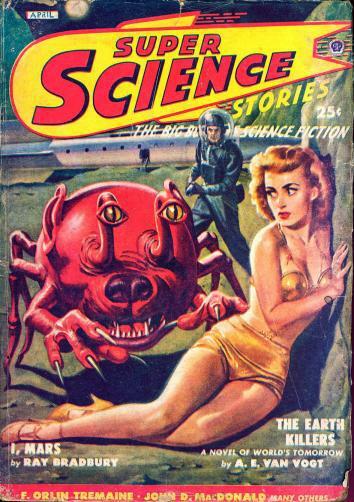 Pulp science fiction’s legacy to women in science. Cover detail of Planet Stories, July 1952. This could, of course, mean that my shoes were beacons of color in the sea of brown and black loafers—but I think it actually reflects a much broader, much deeper truth about our cultural conception of who a scientist is and what he looks like. That’s right, what he looks like. To an overwhelming degree, when we think of a scientist, we picture a middle-aged white man with glasses and a lab coat. And if you don’t look or dress like that, we struggle to figure out which of our many boxes to put you in—because there’s no way you could belong in that box labeled scientist. Our modern vision of the scientist emerged around 1930 alongside a whole new genre of short stories called pulp science fiction. Publishers printed these stories on very cheap paper made from the residual pulp in the printing presses, hence their name. The cut-rate production of these magazines translated to lower prices on the newsstand, which meant that they reached an incredibly broad audience. Their accessibility and engaging style gained them a wide readership, and “the pulps” quickly became a feature of 20th-century American culture. Maybe these stories hold a clue as to why our stereotypical scientist looks the way he does. Maybe pulp science fiction helped create the science culture in which women feel out of place and sometimes even unwelcome. Super Science Stories cover, April 1949. As part of my graduate work, I did a project for which I collected 560 individual stories published in those pulp magazines, an archive totaling more than 6 million words, randomly sampled from 1930 to 1965. Once I put together this pulp science-fiction corpus (a carefully constructed collection of language for study), I set out to uncover the way those authors portrayed scientists by using something called corpus linguistics. Words have meaning based largely on the ways we use them, and corpus linguistics is an incredibly powerful way to use statistics to help uncover that meaning. With the aid of this kind of linguistic analysis, I created an archetype of “the scientist” based on the language used to describe scientists in the pulps. He is a middle-aged or old white man, absorbed in his experiments, defined by his adherence to “true” or “good” science, and is often called upon by other characters to provide scientific or technical insight. Though he spends a good deal of his time talking, others struggle to grasp his meaning and find him difficult to deal with. But there’s more. In this entire collection of pulp science-fiction stories, I found only three female characters whom we would call scientists. The first of these women makes an appearance in the 1945 story “Me and My Shadow” by Berkeley Livingston. Erica Seeling is a Nazi-sympathizing self-described “lady scientist.” While quite obviously nefarious, Erica possesses typically attractive qualities, which makes it difficult for the male characters to be around her. Her beauty is distracting, and even simply occupying the same room makes her male colleagues blush and think lurid thoughts. Disarmingly pretty, clever, and resourceful, this woman is clearly a force to be reckoned with. Nevertheless, her supervisor feels the need to describe her as a genius “in her own way.” The male assistants she works with in the story aren’t described as geniuses in their own ways. They’re simply good at their jobs. The second female scientist appears in 1961 in “The Foreign Hand Tie” by Gordon Garrett. Unlike the comely Erica, Dr. Sonya Malekrinova “was as plain as an unsalted matzoh … if it were possible to die of the uglies, [she] would have been dangerously ill.” She even describes herself several times as masculine, withdrawn, unapproachable, and cold. She works for no one, has a male assistant helping her as opposed to being the assistant herself, and provides crucial help to the Soviet Union. However, like Erica, Sonya is grudgingly respected by her colleagues, “in spite of all the powerful drawbacks that existed in her mind.” She is brilliant, sure, but brilliant despite her gender, her ugliness, and the disorder present in her mind. By the end of the story, she becomes convinced that she is receiving telepathic instructions from alien beings and goes insane as a result. Neither of these characters are particularly inspiring or even positive portrayals of women in science. The last STEM woman in the corpus, Clea Koshar, appears in Samuel R. Delany’s 1963 short story–turned-novel Captives of the Flame. A mathematician, she is first introduced by her boyfriend, to whom she taught probability. She’s a classic exotic beauty, and yet her mathematical specialty is described in detail. She is not only a competent mathematician but a confident and ambitious one; and unlike our successful Soviet doctor, she displays traditionally feminine attributes and mannerisms. This woman, it seems, has the unique distinction of having it all—not demonized by association to a notorious group, like our beautiful Nazi lady scientist and yet at least as successful as the ugly Soviet doctor. Amazing Stories cover, June 1952. So does Clea Koshar, near the end of the era of pulp science fiction, signal a change in popular opinion regarding what a scientifically competent woman looked like? Hard to say. But her uniqueness suggests that she does not represent the norm, either in the pervasive cultural image of “the scientist” as demonstrated in this analysis or the expectations for female characters in the genre at all. You were much more likely to see a woman as a damsel in distress, a secretary, or family member of the main character than one successfully navigating the intersection of femininity and science. We have a few examples of these lingering stereotypes of female scientists in modern popular culture, such the two female scientists on The Big Bang Theory. Mayim Bialik plays the dowdy, often-frazzled, and socially awkward neuroscientist, while the other female scientiston the show, played by Melissa Rauch, is the classic ditzy blonde, whose science we hear almost nothing about. We also see a few strong, accomplished yet still feminine scientists, such as Amanda Tapping’s character Samantha Carter in Stargate SG-1—an astrophysicist and a fighter pilot who manages to help save the universe repeatedly, all while coexisting with her male team without driving them to distraction with her beauty. Or take NCIS’s Abby Sciuto, the brilliant lab technician who rocks her goth style without sacrificing the respect of her peers. Like Clea, Sam and Abby seem to have it all. But the thing all these women have in common is that they’re remarkable in part because they’re women. They’re the outliers in a male-dominated profession, both on and off the page.